Embracing visual and sonic experimentation, Seattle's Terror/Cactus melds Colombian, Argentinian and electronic sounds. "On both ends, it transports the performer and the audience to somewhere otherworldly, a world of spirits and ghosts, of myths and stories and rituals that have been forgotten," he says. "It's kind of a theatrical thing. We put on the masks and let your mind go places it probably wouldn't go if you're focusing on the look on the percussionist's face." Selasco is the sole creator of Terror/Cactus. He launched it as an "official project with a title" about two years ago, but he experimented for years with his exotic mash-up of electronic music and cumbia, Colombian folk music heavily influenced by the rhythm and dance of the country's indigenous people. "I wanted a project with a very focused aesthetic," Selasco says. "I had been doing it for about 10 years, but more recently it consolidated into a band with a live performance aspect, an image and a name and all that." Born in Buenos Aires, Argentina, and raised in the famously international city of Miami, Selasco was exposed to traditional Latin American music early in life by helping package CDs for his father's record label in South Florida. "I would help my dad work on the weekends. We'd go to the warehouse where he kept the CDs and box up shipments," he says. "I'd be like, 'Oh, this is pretty cool,' and take it home and listen to it. I discovered Bolivian music, Peruvian music, Colombian music and Argentine folk. Early on, I had that curiosity." But he didn't jump into making his own Latin-flavored electronica right away. Over the years, he's been involved in a host of musical projects, including a surf/garage-rock band and an electro-tango experiment, and has produced beats for hip-hop artists. "I've been involved in a bunch of different projects, all of which are very different," he says. Speaking to the Inlander from his practice space in Seattle, Selasco explains that Terror/Cactus' live sound is produced by a mix of digital and analog noise-making machines. He's usually accompanied by two percussionists playing conga and timbales (another kind of Latin American drum), but this is mostly Selasco's show. He spends a fair amount of stage time ripping smooth leads on electric guitar, but he also uses a MIDI controller to trigger samples and manipulate tracks programmed in the music sequencer Ableton Live, as well as a synthesizer to produce the bottom-end bass sounds. Though some Terror/Cactus creations are the product of experimenting with strange samples, tweaking effects and "recording random stuff just to see what happens," Selasco often writes songs starting with a melody on guitar. Then he'll sit down with a synthesizer and a percussionist to "see how those melodies translate to a full-fledged production" with a bassline and a beat. But the process rarely stops there. "I'll obsessively go back and change everything until it's kind of like its own world," he says. "Sometimes, I'll start a project like that and have an idea of what it sounds like, and then I'll leave it. When I come back to it, I'll be like, 'That doesn't sound like what I wanted.' Having a fresh perspective helps bring out the intention of the song a little bit more." 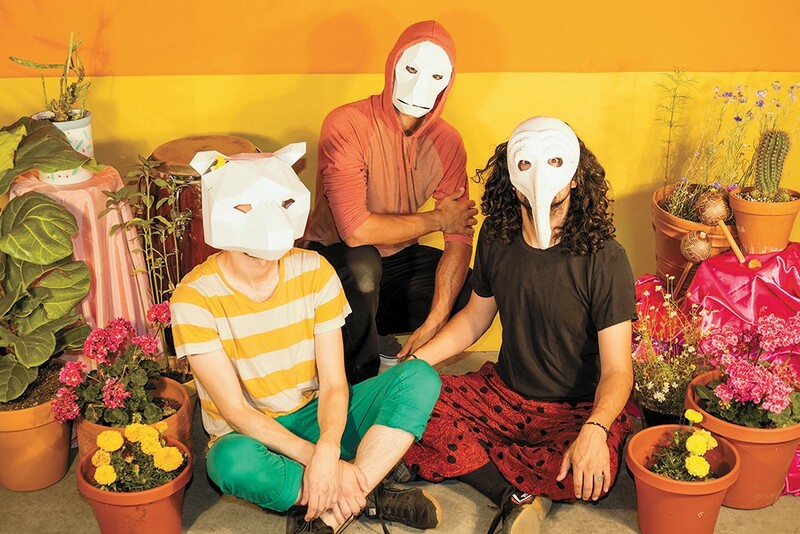 During performances, Terror/Cactus uses the masks to achieve the "altered state" necessary to get lost in its groove-based music. The stage props have also proven to be an engaging visual device, especially since Selasco discovered that the geometric patterns on the plain white masks "really pop" when overlaid with images from a video projector. But Selasco says the masks are most useful for obscuring the performers' sense of self. The original print version of this article was headlined "Masked Marvel"